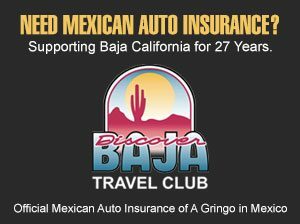 MEXICALI, B.C.– Mexicali – a border town 90 minutes east of San Diego – is known outside of Baja California primarily for its agriculture, its maquiladoras, its Chinatown (la Chinesca), and that Grateful Dead song (Mexicali Blues). 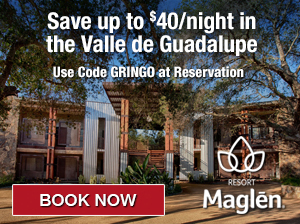 And though most are aware that the metropolis of 700,000 has more Chinese restaurants per capita than any other Mexican city, Mexicali isn’t typically mentioned in the same breath as Ensenada or Tijuana during serious discussions of Baja California cuisine. The best way to get to know any city’s culinary scene is to roll with locals well versed in hometown traditions. Mexicali natives – culinary professional Ana Laura Holguin and chef Esteban Lluis– guided Good Food Mexico City’s Nicholas Gilman and A Gringo in Mexico through Mexicali’s gastronomic history and discussed its potential as a culinary destination. 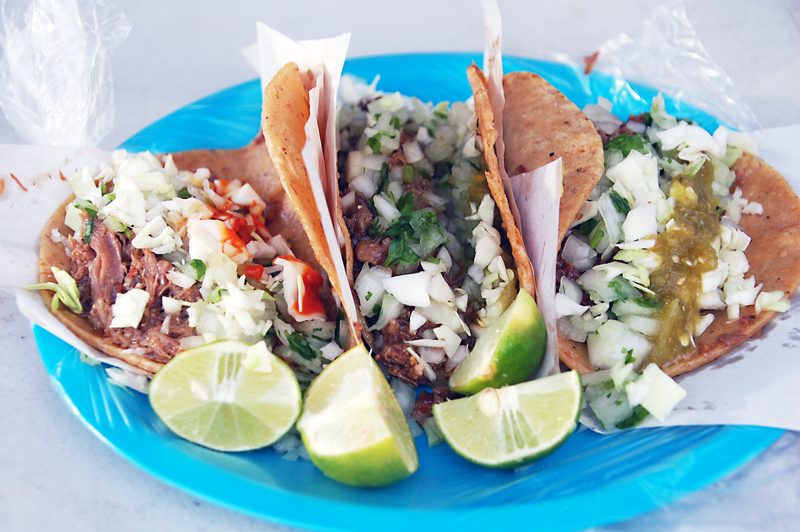 Here are the spots we visited during our Mexicali food and beer tour. When the Chinese migrated to Mexicali in the early 20thcentury to work the region’s nascent agricultural industry, they brought their cuisine with them. Over time, classic Cantonese ingredients were augmented or substituted with what was available in Mexico. Chinese tien tsinchiles for example might be replaced by locally sourced chilis de arbol. There are over 100 Chinese restaurants to choose from in Mexicali, most located in and around the Chinesca. Chef Esteban Luis treated us to lunch at his favorite, China House. Here, dishes are served family style with steaming, just-cooked food heaped onto large platters for the table to share. We feasted on a typical Catonese/Mexican fused dish of lightly battered calamari, asparagus and chistorro; fried rice with shrimp, pork, and green onion; steamed fish in garlic sauce with mushrooms; and Peking duck served with stalks of choy sum, peanuts, hoisin sauce, and a stack of freshly steamed bao on which to pile on the ingredients, fold, and devour. Taco style. 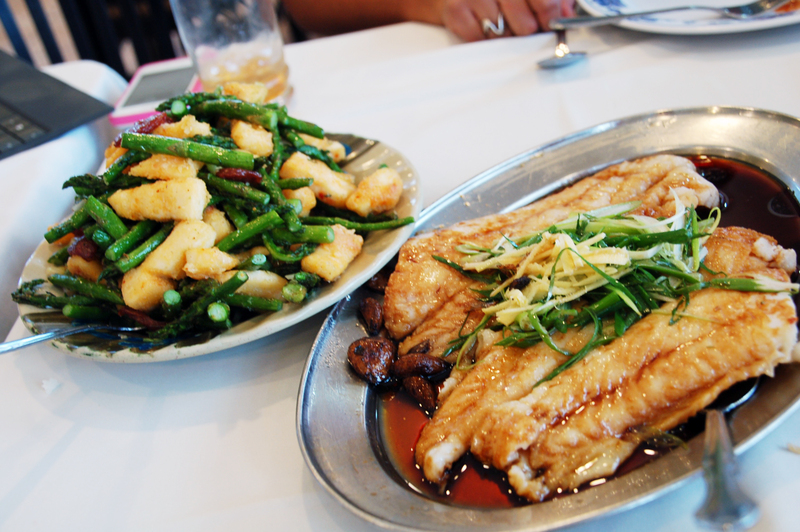 Calamari with asparagus, garlic fish with mushrooms at China House. China House is located at the intersection of Justo Sierra and Carpinteros #1001, Burócrata, 21020 Mexicali, Mexico. +52 (686) 554-8805, www.facebook.com/RestauranteChinaHouse. Open 11AM – 11PM, Mon-Sun. La Cava de Qorot chef Ilean Padilla’s use of local, sustainable ingredients and Mediterranean and French bistro preparations wouldn’t be out of place in the Valle de Guadalupe. In fact, after your meal in the gastro pub’s subterranean dining room, you can buy a round of Ramonetti cheese from the Valle in Qorot’s artisanal shop — as well as a selection of regional and local jams, breads, coffees, and salsas. We sampled small plates of octopus in jamaica with pickled onion, asparagus and guacamole; tostadas of arrachera with grilled jaloro pepper, baby corn, green apple, tomato and jicama; and a desert of baked green apples with house made ice cream and biscuits. Qorot is also known for it’s heartier bistro fare of steaks, burgers, chicken and pastas. 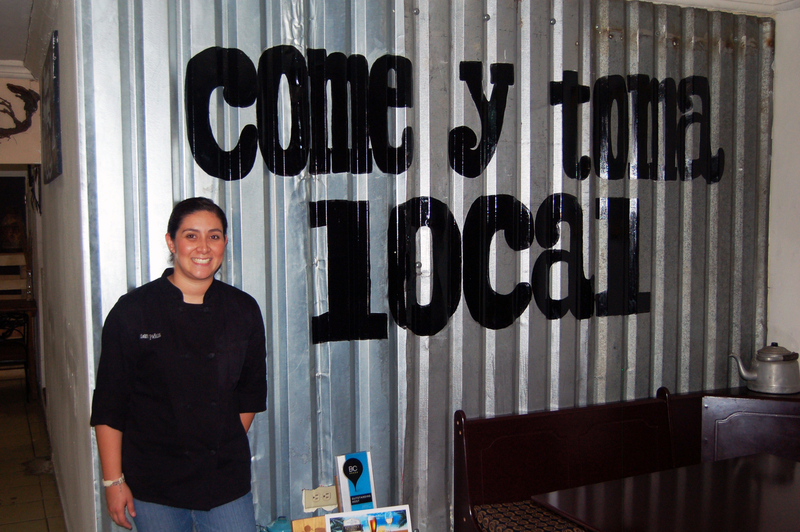 Chef Iliana Padilla at La Cava de Qorot. La Cava de Qorot is located at Blvd. Benito Juarez #1028, Jardines del Valle, 21270 Mexicali, Baja California. +52 (686) 218-0783, www.facebook.com/lacavadeqorotmxl. Open 12PM – 10PM, Mon-Sun, 12PM – 11PM, Fri-Sat. “The favorite cuisines in Mexicali are traditional Mexican and Chinese, so we combine those tastes,” chef/owner Antonio Gurrola began as he seated us in his cozy restaurant The Wok. Gurrola opened The Wok with his brother and sister after having previously consulted for Japanese, Peruvian, and Mediterranean restaurants around the city, so he has a unique perspective on local fusion cuisines and preferences. We enjoyed small, unpretentious plates of shrimp tacos fried with chili guajillo and topped with chili de arbol, cucumber, and cabbage salad; pork belly tacos braised in local craft beer and hoisin sauce with pickled onion, cucumber, pineapple, and leaves of cilantro; and grilled octopus tacos in sesame oil on house-made guacamole topped with black sesame seeds on a fried wonton. 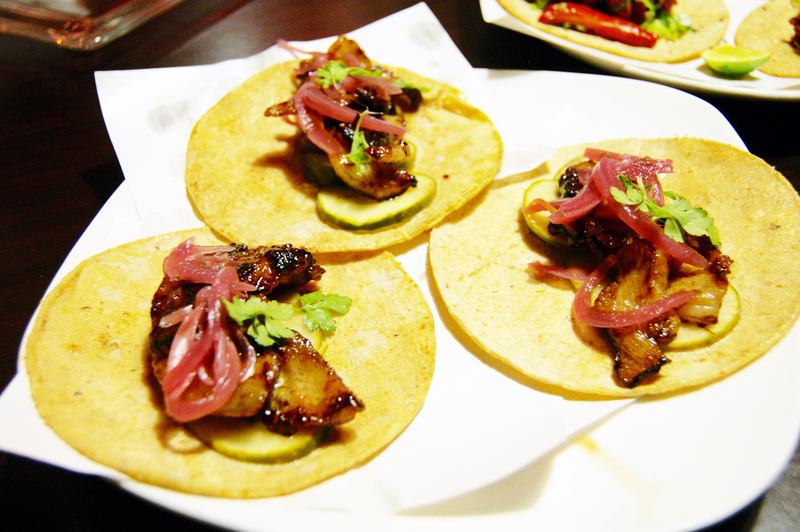 Tacos of pork belly at The Wok. The Wok is located at Avenida Gral. Venustiano Carranza 118, Jardines del Valle, 21270 Mexicali, Baja California. +52 (686) 568-3026, www.thewokmxli.com. Open 12PM – 10PM, Mon-Sat, Closed Sun. Ana Laura’s enthusiasm wasn’t misplaced. Tacos El Cesarin pile generous servings of savory borrego (lamb) and stewed and spiced cabeza (head meat) onto soft, warm corn tortillas. Best topped with onion, cilantro, salsa and a squirt of lime, and washed down with a bottle of Mexican Coca-Cola. Tacos de borrego at El Cesarin. Tacos El Cesarin is located across the street from the Wal-Mart at Calle Novena #1769, Plutarco Elías Calles, 21376 Mexicali, Baja California. Mexicali’s proximity to San Diego makes it easy for local brewers to order ingredients and ship equipment from the U.S. craft beer captial. When it comes to quality cervezas, the city can go mug-to-mug against Tijuana and Ensenada. The city is host to an annual craft beer festival and Mexicali’s microbrands have won awards in tasting competitions throughout Mexico. I personally find most craft beers to be too hoppy and heavy. But the lighter, yet still robust and flavorful cervezas at Muxa were a revelation. “We base our beers on what is preferred in Mexicali’s dry, hot climate,” owner and brewer Alejandro Rojas explained. 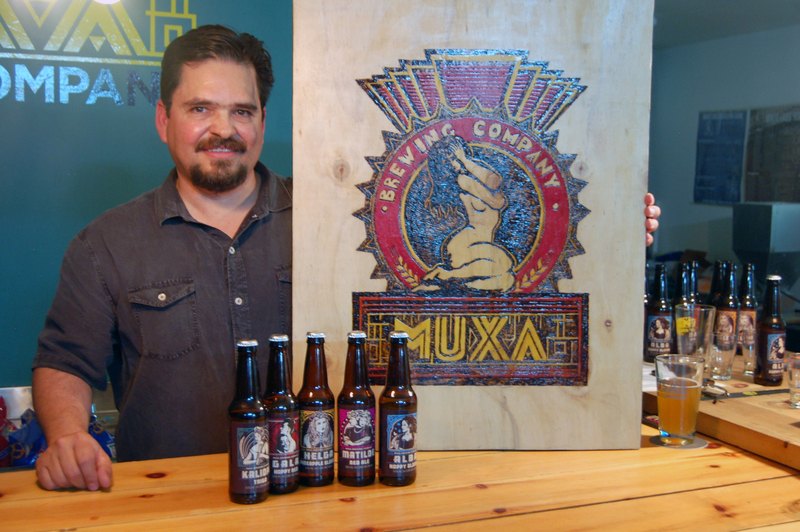 “So they’re very refreshing, easy to drink, and have a low alcohol content.” Muxa is scheduled to open a tasting room this year. In the meantime, head over to The Show Beer Rock Bar where affable owner Rodrigo Hernández Mijares will be happy to introduce you to some of his favorite local drafts – including those from his own Big Bad Brewing Company (aka Tres B). The Show Beer Rock Bar also hosts bands and features a weekly “Punk Night”. When we were sampling a flight of Tres B on the patio, classic rock was blasting from inside the eclectically painted bar. My kind of place! Owner Aleandro Rojas of Muxa. The Show Beer Rock Bar is located at Calzada Cuauhtémoc #1326, Santa María, 21240 Mexicali, Baja California. +52 (686) 244-4489, www.facebook.com/The-Show-Beer-Rock-Bar-1379229655643292. Open 6PM – 2AM, Tue-Sat, 7PM – 1AM, Sun. Our hosts at La Cava de Qorot, The Wok, Muxa, and The Show Beer Rock Bar generously fed and “watered” us with samples of their menu items and craft beers. The author has not received any compensation for writing this article. All opinions are those of the author who would gladly return to any of these establishments on his own peso. A Gringo in Mexico would also like to thank The Hotel Posada Inn in Mexicali for providing complementary overnight accommodations for us as we explored the city.